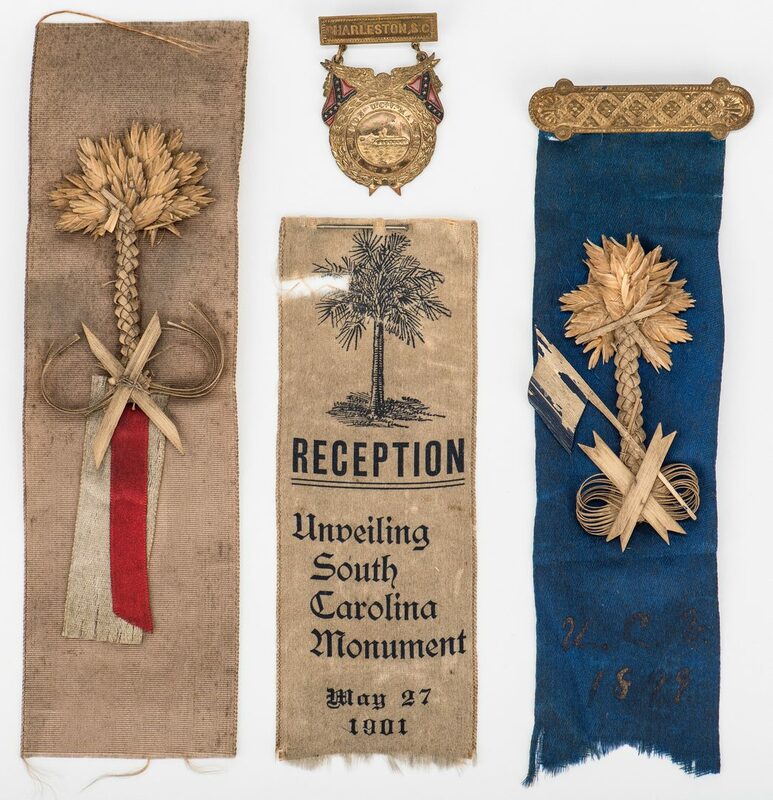 Four (4) South Carolina United Confederate Veterans items belonging to Colonel Tomlinson Fort. 1st item: Chickamauga Battlefield Monument, South Carolina unveiling reception off white printed silk ribbon, May 27, 1901. 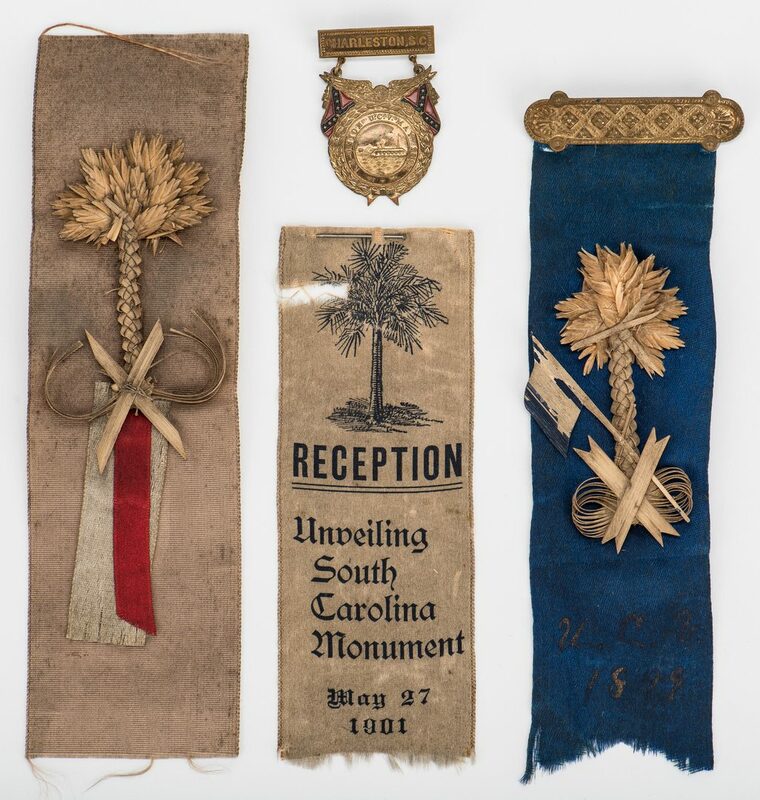 Depicts the palmetto of the South Carolina state flag above "Reception Unveiling South Carolina Monument May 27 1901". Stick pin, top of ribbon. 6 1/2" H x 2 1/2" W. 2nd item: South Carolina UCV badge, 1899. 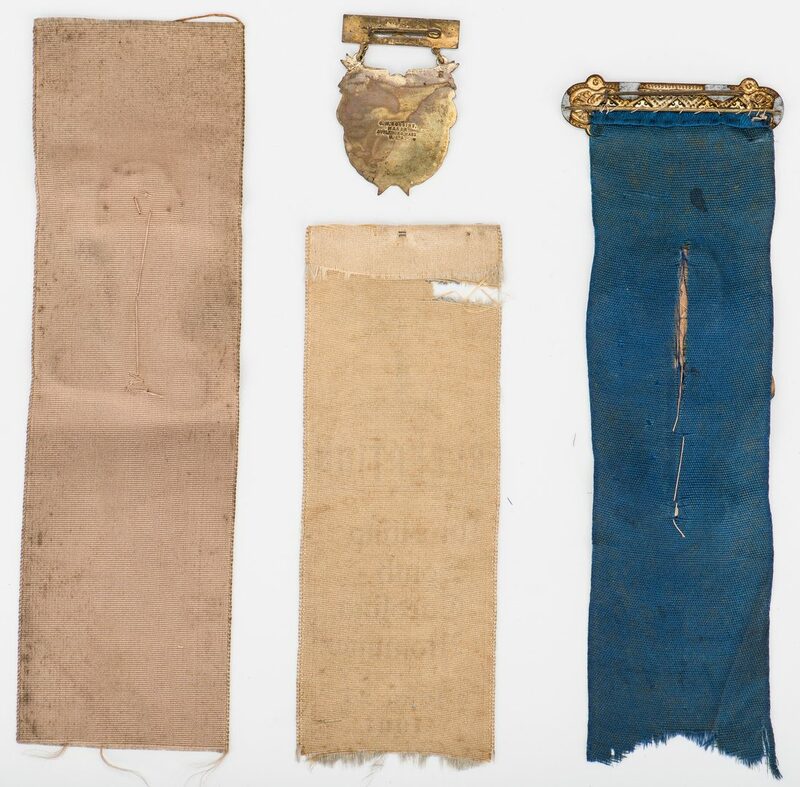 Consist of a brass tone metal hanger with embossed decorations and a dark blue silk ribbon with a straw palmetto and blue painted flag, possibly the Bonnie Blue Flag, sewn to surface with "U. C. V. 1899" written in gold ink. 8 1/8" H x 2 3/4" W. 3rd item: South Carolina UCV off white silk grosgrain ribbon with a straw palmetto and one off white and one red silk ribbon sewn to surface. 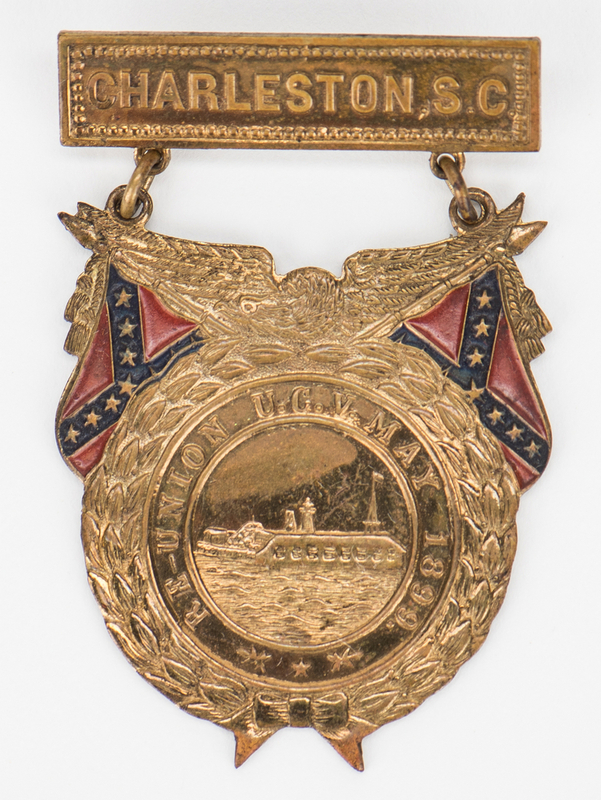 8 3/4" H x 2 5/8" W. 4th item: Charleston, SC UCV reunion badge, May 1899. 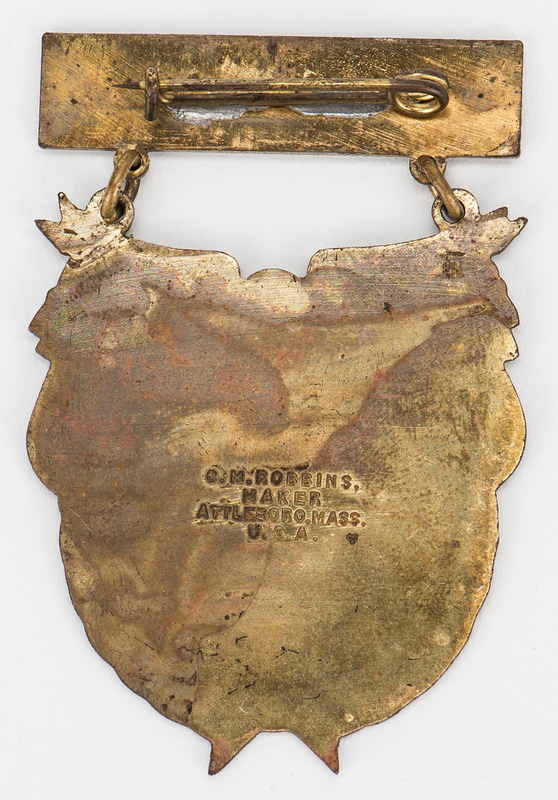 Consists of a brass tone metal hanger embossed "Charleston, SC" and a brass tone medallion drop featuring an eagle resting on a laurel wreath with outstretched wings between two Confederate flags embossed "Re-Union U. C. V. May 1899" surrounding a maritime scene. Manufacturer's marks for Charles M. Robbins, Attleboro, MA, en verso of medallion drop. 2 1/4" H x 1 1/2" W. Provenance: Private Ringgold, Georgia collection; among items purchased in the 1960's from the old location of the A. P. Stewart Chapter of the UDC (United Daughters of the Confederacy), formerly the Nathan Bedford Forrest UCV (United Confederate Veterans) home, St. Elmo, Chattanooga, TN. Biography: Colonel Tomlinson Fort (1839-1910) was born in Milledgeville, Georgia, to Dr. Tomlinson Fort (1787-1859) and Martha Low Fannin (1804-1883). Tomlinson Fort graduated from Oglethorpe University in 1857, and moved to Savannah, Georgia to practice law. Fort returned to his hometown to care for his fatherís estate in 1859. At the beginning of the Civil War, Fort joined the 1st Georgia Infantry regiment and served throughout the war. Fort's two brothers also served in the war; Lieutenant John Fort joined the 1st Georgia Infantry regiment and Dr. George Washington Fort was a surgeon, 53rd Regiment, Georgia Infantry. Fort was wounded five time during the Civil War including Malvern Hill, Second Manassas, and Johnís Island, SC. Tomlinson Fort was captured in late 1864 until the remainder of the war. Fort moved to Chattanooga in 1865, and though he came to the city with very little, he quickly found work, and by the mid-1870s, was one of Chattanoogaís leading businessmen. Fort served as city attorney, city recorder and served on the Board of Public Works before being elected Mayor in 1876. Fortís election to the office marked a turning point for the city, as he was the first ex-confederate elected mayor and was able to improve the cityís financial status. (source: http://www.chattanooga.gov/about-chattanooga/history-of-mayors/1876-colonel-tomilinson-fort). See related lots 506, 507. CONDITION: 1st item: Overall good condition with fraying, surface grime to ribbon. 1 /4" x 1" area of loss, top left of ribbon. 2nd item: Overall good condition with area of tarnish to hanger. Fraying, 1/2" tear to ribbon. Writing faded but visible. Losses to majority of blue paint to flag. 3rd item: Overall good condition with minute stains, fraying to grosgrain ribbon. Palmetto in overall good condition. Tears, largest 1" to silk ribbons. 4th item: Overall good condition with areas of tarnish.